Commercial bathrooms are demanding environments. They must be easy and efficient to use and durable enough to withstand intense daily use. Commercial Products Please click on images to view our full range. Maintain your mobility in the bathroom with our large range of grab rails. With quality stainless steel construction and a large range of finishes. A hand towel dispenser has a stainless steel construction to reflect a modern design. It is designed so that you can use the paper without having to touch the actual unit, promoting clean and hygienic habits. We offer our range of accessible toilet suites to make life easier regardless of age, illness or disability. Our extensive accessible range offers practicality, without compromising on style. 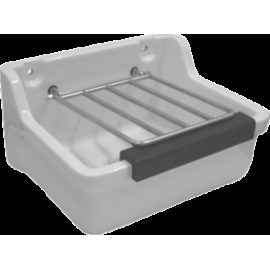 Care basins are suitable for independent living as they feature accessibility to the tapware.